The portfolio series represents a cross-section of the artist's creative expression. Further it unfolds the process, thoughts and reveal hidden techniques used by the artist. 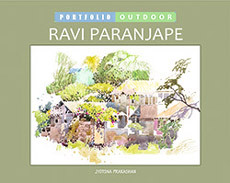 Eminent artist Ravi Paranjape is well-known for his unique style and use of colour. This portfolio represents selected samples of outdoor work taken directly from his sketch-books, covering a period of about 40 years. While explaining how outdoor study is essential in the development of an artist, he underlines the importance of drawing and shares his thoughts and techniques about using mediums like watercolour, pastel, colour pencil, pen & ink and gouache. You can get a fresh insight to look at the subject and handling of the medium by carefully studying these works. His magnificent work is not only inspiring to art students and art lovers but also helps to understand the artist's creative process and aesthetic refinement.